A few months ago, I bought a different motorcycle — a Suzuki DL650 V-Strom. I bought a new helmet, too. Before I bought a new helmet, I did research on good motorcycle helmet brands for street use. In the end, I bought a Shoei Qwest, which fit my needs and price well. But Shoei was only one of the brands I considered. Here is a non-comprehensive list of manufacturers who make some of the best motorcycle helmets on the market for street use, along with a review of the Shoei Qwest. Find a good motorcycle helmet in 2019 on Amazon. AFX: AFX has been around since 1996, with US headquarters in Cerritos, Calif., and Candaidan headquarters in London, Ontario. They are a family-owned and operated company. Their sole focus are helmets. Product offerings include road and off-road helmets. AGV: AGV was founded in 1946 by Gino Amisano. They started out making motorcycle saddles and leather seat then started making helmets a year later. AGV is currently headquartered in Alessandria, Piedmont, Italy, and their parent company is Dainese. Arai: Arai was founded in 1926 by Hirotake Arai. Its current headquarters are Omiya-ku, Saitama, Saitama Prefecture, Japan. Arai helmets are hand-made. Despite being Snell and DOT certified, Arai helmets are “buil[t] to exceed the standards,” according to their website. Fly Racing: Fly Racing’s roots go back to 1998. They got their start with handlebars and helmets. The company is headquarters in Boise, Idaho. Product offerings for the street include full-face and 1/2- and 3/4-helmets. They also offer helmets for off-road and snowmobile riders. HJC: HJC has made motorcycle helmets since 1971. They have full-face, open-face, modular, off-road, snow, and auto offerings. “We have a helmet for every price point, style and size, so dealers don’t have to carry any other brand,” George Hong, president of HJC America, said to Dealernews.com in 2013. Icon Motorsports: Icon’s headquarters is in Portland, Oregon. They offer full-face helmets, along with riding apparel for men and women. Kabuto: Founded in 1982, OGK Kabuto offers full-face and open-face helmets. LS2: LS2 Helmets, whose roots begin in 1990, was started by Arthur Liao in a 600 square foot house. The company offers full-face and open face helmets, along with offerings for the street and off-road. Nolan: Started Bergamo, Italy, in 1972, Nolan helmets. They offer open-face, full-face, modular, crossover helmets. Reevu: Reevu was started in 1999. The company created a way to make an “integrated rear vision system that helps prevent accidents” in their helmets. Schuberth: Schuberth’s roots begin in 1922 in Germany, but in 1954 they started producing motorbike helmets. They offer products for motorcyclists, car racers, along with products for the military, police, fire service and industrial safety workers. Scorpion EXO: Scorpion EXO has been making helmets and motorcycle apparel for more than 10 years. They offer helmets for the street and dirt. Shark: Headquartered in Marseille, Shark is a French-based company that has been producing helmets for more than 25 years. Their product lines provide helmets for street and off-road riders alike. Shoei: Shoei started manufacturing safety helmets in 1959. By 1960, they began making motorcycle helmets. They offer a wide range of helmets for the off-road rider to street rider to racer. Simpson: Simpson is a well-known brand in the automotive racing industry. For motorcycles, they offer full-face helmets. Suomy: Started by Umberto Monti in 1997, Suomy is an Italian company that makes helmets. They offer a wide range of full-face helmets for street and off-road. The Qwest is a full-face motorcycle helmet — designed for more upright riders. It is more of a commuter or touring helmet, which is visible with the shell’s profile. Venting is good on this helmet. 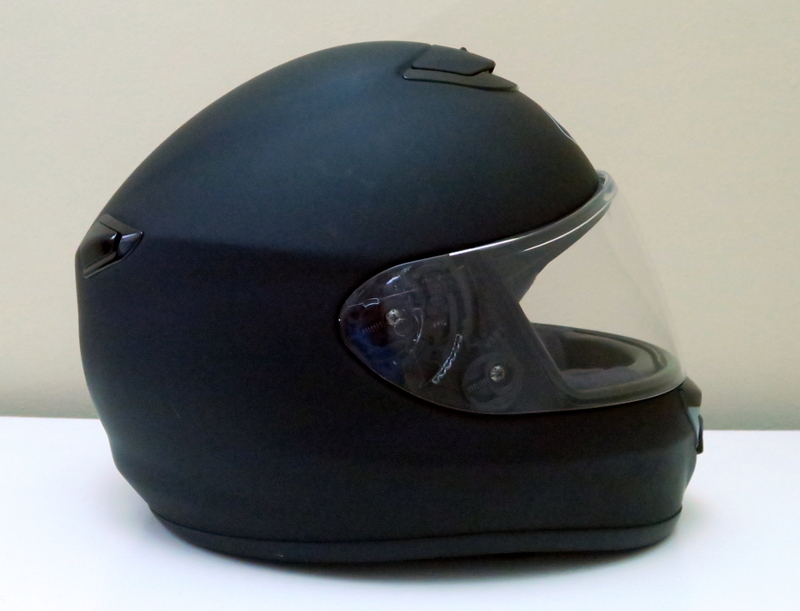 The Qwest has a large vent below the visor, which helps keep the visor from fogging. There is also a vent up top. It is fairly high up with the intent that riders who use this helmet may have larger than average windshields. There are also two vents on the rear of the helmet. It is fairly quiet — I can’t say if it is the quietest motorcycle helmet but it is fairly good. It does have a little whistle when the visor is up. The shield locking mechanism offers a lock to keep the shield in place during high speed runs at the track. The mechanism also offers a way to leave a small crack open along the front of the helmet. This crack provides a little air to enter the helmet and help eliminate fogging. The mechanism also has a few different detents, so the visor can be open further. The visor has a small lip on the top of it, which acts as a seal to keep water out of the inside of the helmet while riding in the rain. The visor comes off easily, as well. The interior has a round oval fit, which is good for those of us with a little rounder of a head. The cheek pads are removal and washable. Under the cheek pads, there is a small hole for a communication setup. There is ample chin space for a microphone as well. 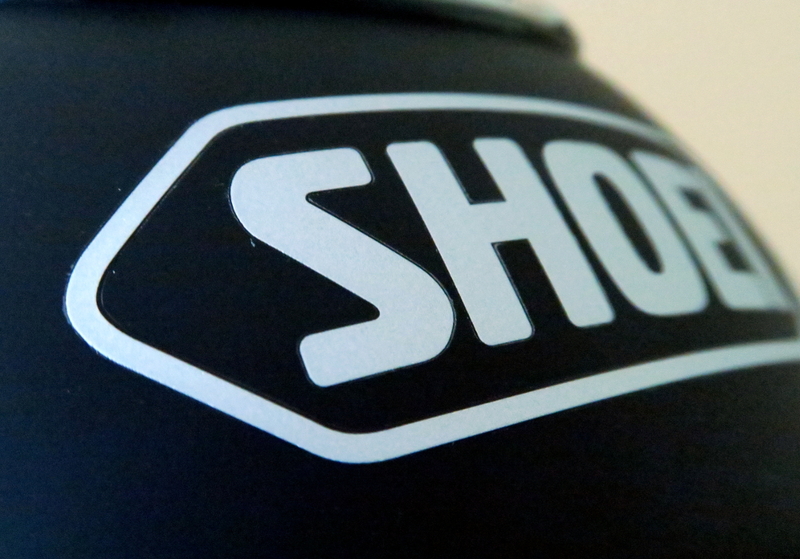 As a brand, Shoei stands behind their products: They offer a five year warranty from the purchase date and seven year warranty from the date of manufacture. I like the Qwest. It fits me well and suits my riding style. I bought the matte black finish, which was all the local shop had in stock. (I think bright colors and graphics make for some of the best looking motorcycle helmets.) The graphics do increase the price by about $100 dollars. Options abound where you can buy a motorcycle helmet. Local motorcycle dealers are your best place to buy a motorcycle helmet. At a local shop you can try the helmet on and eliminate buying a too-small or too-big helmet. Nobody wants an ill-fitting helmet. They can help fit you if you don’t know how. A local shop will know what style helmet to suggest depending on your riding. You, also, support the local economy. If you know what you want and are not against ordering online, there are many, many options. I can’t list every online retailer, but I have ordered from RevZilla and Amazon — both with excellent results. Find the best motorcycle helmet brands on the market in 2019 on Amazon.